In the history of the modern civil rights movement, certain moments and events are fixed in our collective memory across generations: Rosa Parks on the bus in Montgomery, the “Little Rock Nine” entering Central High School, Martin Luther King, Jr.’s “I Have a Dream” speech delivered from the steps of the Lincoln Memorial. Yet, as indelible as these moments are, they belie the fact that the modern civil rights movement was a national campaign that addressed grievances and sparked change across the country, not just in the American South. Here in Philadelphia, significant milestones in the fifteen-year struggle to desegregate Girard College often occurred within weeks and even days of desegregation efforts elsewhere and, what is more, civil rights issues in Philadelphia regularly attracted national attention. New York Times coverage of both the Columbia Avenue riots and Girard College controversy was common, as was commentary and involvement from such national figures as President Lyndon Johnson, Senator Barry Goldwater, Thurgood Marshall, and Attorney General Robert F. Kennedy. As this dual timeline of key civil rights events reveals, what happened in Philadelphia carried national significance and vice versa, a fact that enriches our understanding of the scope and legacy of modern civil rights movement. 1948 July 26: President Truman signs Executive Order 9981 ending segregation of the United States Armed Forces. April: The Commission on Human Relations, a city agency charged with the enforcement of Philadelphia’s anti-discrimination laws, is established as part of new Home Rule Charter. May 20: Philadelphia City Council resolves that all boys should be admitted to Girard College regardless of race or color and announces its intention to petition the Orphans’ Court to interpret Stephen Girard’s will in light of the resolution. May 17: Ruling that “separate, but equal” facilities are “inherently unequal,” the U.S. Supreme Court strikes down public school segregation in Brown vs. Board of Education. July 29: Judge Robert V. Bolger of the Philadelphia Orphans’ Court upholds the Board of City Trust’s decision to deny admission to two African-American boys, citing the guidelines codified in Stephen Girard’s will. December 1: Rosa Parks refuses to give her seat to a white passenger on a public bus and is arrested in Montgomery, Alabama. Her act of civil disobedience inspires the Montgomery Bus Boycott, which lasts 381 days and makes a national figure out of the Reverend Dr. Martin Luther King, Jr.
April 29: Without hearing oral arguments, the U.S. Supreme Court unanimously finds that the racial ban on admissions at Girard College constitutes racial discrimination by the state of Pennsylvania and violates the 14th Amendment. October 4: In an effort to circumvent the Supreme Court’s ruling, the Orphans’ Court removes the Board of City Trusts as trustee of Stephen Girard’s estate and appoints 13 new trustees for Girard College, effectively making the school a private institution. September 4: Arkansas governor Orval Faubus deploys the Arkansas National Guard to prevent nine African-American students from enrolling at Little Rock Central High School. On September 24, President Eisenhower orders the 101st Airborne Division to Little Rock and federalizes the Arkansas National Guard to force the integration of the school. June 30: The U.S. Supreme Court upholds the appointment of the 13 new Girard trustees. As a private institution, Girard College can determine its own admissions policies. February: Inspired by the Woolworth’s sit-in in Greensboro, North Carolina, the Philadelphia Youth Committee Against Segregation pickets Woolworth’s stores in neighborhoods with significant black populations. June: In an effort to promote equal opportunity employment at Philadelphia’s leading companies, Reverend Leon H. Sullivan collaborates with 400 ministers to boycott businesses with discriminatory hiring practices, including Tasty Baking Company, Gulf Oil, and Pepsi Cola. Under the slogan “don’t buy where you can’t work,” Sullivan’s selective patronage campaigns attract national attention and help unify Philadelphia’s black community. February 1: The sit-in protest movement begins at a Woolworth’s lunch counter in Greensboro, North Carolina. This new form of direct-action protest spreads across the South and brings national attention to the civil rights movement. December 15: Cecil B. Moore is elected President of the Philadelphia chapter of the NAACP. Moore sees his election as a mandate for direct action on civil rights and a militant desegregation program that includes Girard College. October 1: James Meredith becomes the first African-American to enroll at the University of Mississippi. His enrollment sparks riots at the school and U.S. Marshals are dispatched to ensure Meredith is admitted and quell violence. April: Inspired by the work of the Southern Christian Leadership Council, the Philadelphia branches of CORE and the NAACP protest discriminatory hiring practices in city-sponsored building projects. Protesters gather at City Hall, Mayor Tate’s home, and other public spaces and also regularly interfere with building projects throughout the city. August 28: A. Phillip Randolph and Bayard Rustin organize the March on Washington for Jobs and Freedom to advocate for the passage of “meaningful civil rights laws” and greater economic rights for African Americans. Dr. Martin Luther King, Jr., delivers his famous “I Have a Dream” speech from the steps of the Lincoln Memorial. September 15: In the wake of desegregation efforts in Birmingham, Alabama, the 16th Street Baptist Church is bombed by members of the Ku Klux Klan, killing four young African-American girls. The bombing leads some civil rights activists to question the efficacy of non-violent protest and provides a major impetus for the passage of the Civil Rights Act the following year. August 28: A clash between police officers and North Philadelphia residents sets off three-days of rioting on Columbia Avenue. July 2: President Johnson signs the Civil Rights Act of 1964 into law. The Act bans discrimination based on “race, color, religion, or national origin” in employment practices and public accommodations. July 18: Riots erupt in Harlem after an African-American teenager is shot and killed by an off-duty police officer. Throughout the summer, similar clashes between police and residents in predominately African-American neighborhoods lead to race riots in Rochester, Patterson, Jersey City, and Philadelphia. February 6: Cecil B. Moore is re-elected President of local NAACP. Moore sees his re-election as a mandate to make the desegregation of Girard College a top policy priority. May 1: Led Cecil B. Moore, the NAACP begins picketing at Girard College. August 3: On a visit to Philadelphia, the Reverend Dr. Martin Luther King, Jr., addresses demonstrators at Girard College. December 16: A suit challenging Girard College’s admissions policy is filed in U.S. District Court by city and state officials, as well as the mothers of seven African-American boys seeking admission to the school. The next day, picketing ends at Girard College after seven months of protests. March 7: Civil rights marchers in Selma, Alabama are beaten by Alabama State Troopers in what becomes known as “Bloody Sunday.” Later that month, marchers successfully complete the journey from Selma to Montgomery to highlight restrictions on African-American voting rights. August 6: President Johnson signs the Voting Rights Act of 1965 into law. The Act establishes federal oversight of elections administration and outlaws poll taxes, literacy tests, and other requirements designed to disenfranchise African Americans. September 2: U.S. District Court Judge Joseph S. Lord rules that, under Pennsylvania law, African-Americans cannot be excluded from Girard College on the basis of race. In October, picketing resumes at Girard College after the trustees vote to appeal Judge Lord’s decision. October 15: Bobby Seale and Huey P. Newton found the Black Panther Party in Oakland, California. Known for its militancy and provocative rhetoric, the Party becomes a leading voice in the emerging Black Power movement. February 28: The Third Circuit Court of Appeals strikes down Judge Lord’s previous ruling, concluding that the case should be decided according to constitutional rights rather than state law. July 5: Judge Lord rules that the seven African-American students seeking admission to Girard College were denied equal protection under the 14th Amendment and concludes that they cannot be denied admission to Girard because of their race. July: Race riots erupt in both Newark, New Jersey and Detroit, Michigan. March 4: The Third Circuit Court of Appeals unanimously upholds Judge Lord’s ruling that seven African-American students be admitted to Girard College. May 20: The U.S. Supreme Court refuses to hear an appeal of the Third Circuit Court ruling, thus paving way for the integration of Girard College. May 23: The Girard College trustees vote to admit African-American students to the school. June 24: An estimated crowd of 600 attend a victory rally at Girard College. 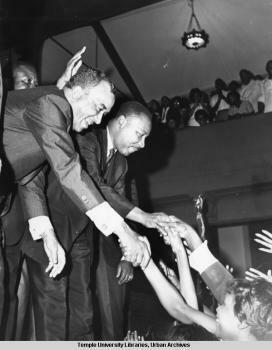 April 4: The Reverend Dr. Martin Luther King, Jr., is assassinated in Memphis, Tennessee. The assassination sparks riots in cities across the country, including Washington, D.C., Chicago, and Baltimore.